Saturday morning, Lydia and I jumped in the car to find some yard sales and it was a little disappointing because we weren't seeing signs anywhere. Finally we saw a sign and thinking it was not far down that particular country road, I decided to turn off and find it. Well, we kept driving, and driving and I almost turned around when Lydia spotted a sign for it in the distance. But when we got there we realized it was in an outbuilding of an old church. If Lydia hadn't pleaded to get out, I would have just left. It did not look promising at all! We went in and the place was dark and dirty and most of it was just junk. I wasn't seeing anything but then Lydia asked if we could go to the back of the building (where it was the darkest and scariest, lol!) and there to my surprise, way up high on an old, dusty cabinet, was this beauty. Love at first sight. =D And for $2, I was happy to take her home. It's chippy and scratched up, but I really like it this way. And it is the most perfect shade of orangey-red. But who knows, perhaps I will break out the spray paint. I just don't think I can find that perfect of a red though! There's always been a white lamp sitting there but I am loving this fun splash of color. 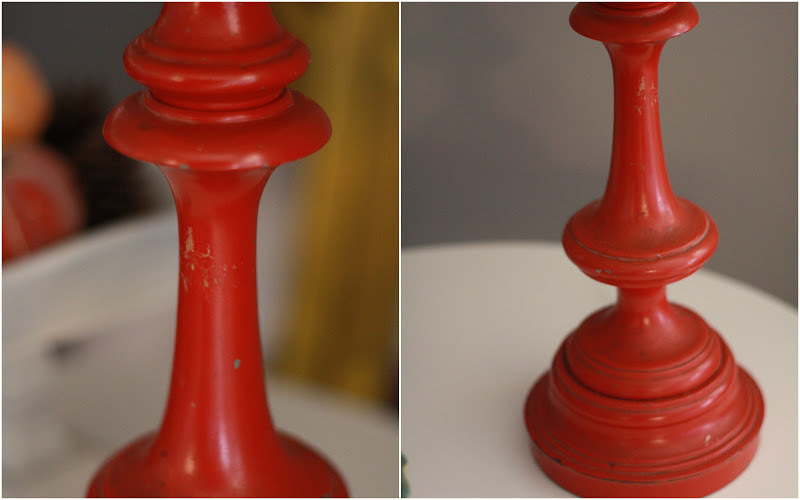 And now, for the debate of the century (kidding, kidding)...the placement of the red lamp! Okay friends, so what's your vote...right or left? 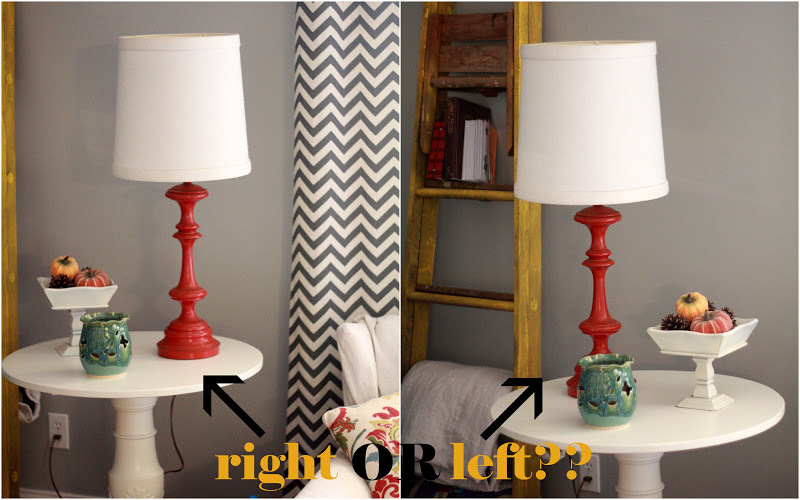 b) put the white lamp back and go back to less colorful "color scheme"
c)do you like pops of color? I think I like it on the left, but I really want to know where you got your chevron curtains! What a great find! Keep it on the right, and keep the red! Love the lamp! Keep it red just the way it is....and that's coming from someone who loves neutral colors. I am starting to like the pops of color...hhmmm, maybe my taste is changing....and I vote right! Love your blog...thanks for sharing your family with us. I say leave the lamp. Your accessories are good except they need some grounding. They look to be floating on the tabletop. If you put some kind of runner/hankerchief or even a pretty hand towel down underneath the items and place them a little closer together it will seem a bit more pleasing to the eye. Hope that helps. What would it look like if you put the lamp dead center and then grouped 3 accessories around it? first - do you have new curtains you haven't told us about??? LOVE! Love the red lamp! I like the right arrangement. but do like what a previous commenter said - maybe put those 2 things on a tray or something? or stacked on a large book or stack of magazines? and maybe play with adding a 3rd item (always work in odds). But I never know if you are supposed to count the lamp as one of the items? and maybe do something to the shade. a border on the bottom of black (or dark gray) ribbon - whatever is in your curtains? or something like that? I like it on the left... Like the color pop. Maybe you should give the shade some pizazz - some fancy trim or something. Pops of color keep things fun and you can always swap it out for neutrals if you need a change...but I won't let you paint the lamp! ;)I just love how the red looks next to that awesome yellow ladder! Of course, when it's on the right it also brings out the red in the pillow on the couch so it works either way, but you have to be able to turn it on.